Conversation and information for the Southwoods advanced permaculture design workshop. Maps: A main tool of a designer, but “the map is never the territory”. Be careful not to design just from maps, no map tells the entire story that can be observed on the ground. A sequence of maps is valuable to see clearly where to place elements: Water, Access, Structures, Topology etc. The analysis of elements: List the needs, products, and the intrinsic characteristics of each element. Lists are made to try and link the supply needs of elements to the production needs of others. Experiment on paper, connecting and combining the elements (buildings, plants, animals, etc) to achieve no pollution (excess product), and minimum work. Try to have one element fulfill the needs of another. Experiential: Become conscious—of yourself, feelings, and environment. Can be free-conscious or thematically-conscious. Zazen-walking without thinking, unreflective. the question, “Where does this (element) go? How is it placed for maximum benefit in the system? Maps (be careful- the “map” is not the territory”) Must make observations. Become conscious of yourself, feelings, environment. Can be free-conscious or thematically-conscious. Zazen- walking without thinking, unreflective. Putting It Together: Use all the methodologies of design. Zones: It is useful to consider the site as a series of zones (which can be concentric rings) that form a single pathway through the system that moves outward from the home center. The placement of elements in each zone depends on importance, priorities, and number of visits needed for each element. E.g. a chicken house is visited every day, so it needs to be close (but not necessarily next to the house). An herb garden would be close to the kitchen. Species, elements, and strategies change in each zone. SECTORS: the aim of sector planning is to channel external energies (wind, sun, fire) into or away from the system. 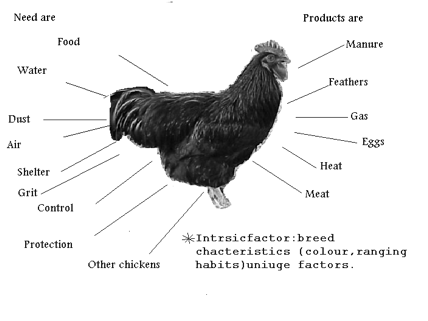 The zone and sector factors together regulate the placement of particular plant, animal species and structures. ORIENTATION: placement of an element so that it faces sun-side or shade-side, depending on its function and needs. Principle Summary: Definition of Permaculture design: Permaculture design is a system of assembling conceptual, material, and strategic components in a pattern which functions to benefit life in all its forms. It seeks to provide a sustainable and secure place for living things on this earth. Functional design: Every component of a design should function in many ways. Every essential function should be supported by many components. Principle of self-regulation: The purpose of a functional and self-regulating design is to place elements or components in such a way that each serves the needs, and accepts the products, of other elements. -Barrat, Krome, Logic and Design, Design Books, Guilford, CT, 1980. -Birkeland, Janis, Design for Sustainability, Earthscan, Sterling, Virginia, 2004. -Fuller, Buckminster, Synergetics, Macmillan Publishing Company, NYC, 1975. -Grillo, Paul, Form Function Design, Dover Publications, NYC, 1960. -Hemenway, Toby, Gaia’s Garden: A Guide to Home-Scale Permaculture, Chelsea Green Publishing Company, White River Junction, Vermont, 2001. -Holmgren, David, Permaculture: Principles and Pathways Beyond Sustainability, Holmgren Design Services, Victoria, Australia, 2002. -Lyle, John Tillman, Regenerative Design for Sustainable Development, John Wiley and Sons, NYC, NY, 1994. -Lyle, John, Design for Human Ecosystems, Island Press, Washington DC, 1999. -McHarg, Ian, Design With Nature, American Museum of Natural History, Garden City, NY, 1969. -Mollison, Bill, Introduction to Permaculture, Tagari Publications, Tyalgum Australia, 1991. -Mollison, Bill, Permaculture: A Designer’s Manual, Tagari Publications, Tyalgum Australia, 1988. -Schneider, Michael, Beginner’s Guide to Constructing the Universe, Harper Collins, 1994. -Todd and Todd, Nancy and John, From Eco-Cities to Living Machines, North Atlantic Books, Berkeley, CA, 1993. -Van der Ryn, Sim and Cowan, Stuart, Ecological Design, Island Press, Washington DC, 1996. -Yeang, Ken, Designing With Nature, McGraw Hill, Inc., NYC, 1995. Class Authors (APDC Attendees) are encouraged to place comments, materials, insights, and discoveries on this blog. This central sharing resource will be used to pull information into designs and to share information and resources. Please publish entries an comment as we carry the conversation deeper into the issues an solutions we discover. This is a private blog except for those you invite by giving them the URL. See you on the 29th!